What if the ultimate computer Firewall protection turned out to be the ultimate computer snooper? The first draft of this book was written in 1995 as speculative fiction. It no longer refers to the future; it could happen today. I have tried to update many places and technologies to match today’s world but please forgive if places described no longer exist or have changed dramatically from what is pictured in the writing. The Bahamas Junkanoo celebration was stretched to fit the story and the author’s imagination. In certain instances, like James’s island in the Bahamas, locations exist only in the author’s mind. 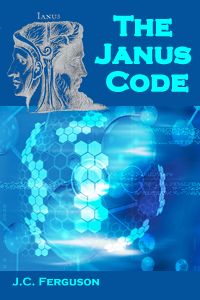 In this day and age of internet snooping, hacking, and terrorists trying to gain access to our computer information, The Janus Code is a timely thriller. J.C. Ferguson shows us two faces of evil and has written a page turner of suspense and intrigue. The characters are fully developed and the scenes take you to locations favored by the elite. I read the Janus Code straight through. I couldn't put it down. It is timely and prescient. Feminists will love it and even men who are still human enough to understand the personality defects that often come with their genius. Of course, the part about surveillance tactics... I'm sure Mr. Snowden would like that part. Complex and compelling characters and plot. I highly recommend it for anyone who is concerned about living in today's all-pervading electronic world. The action mounts as The Janus Code takes the reader to Europe, to Boston, and the Bahamas with mounting suspense. It reads like a gripping James Bond as the characters run for their lives. J. C. Ferguson provides a knowledgeable, well-researched,and well-written novel of computer technology that keeps you turning pages to its surprise ending. Who are the good guys; who are the bad? This unique story, with its ghost, spies, and life-threatening situations, captivates like a seat-of-your-chair high-tech, action-suspense movie. This book was an awesome read! I was reluctant to actually download it and read it, knowing it's not my forte or genre that I enjoy reading. The characters - James, Karen, Felix, Irenee, and the ghost of Maurice (if he's actually a ghost at all), were people you cheered and/or booed along the way. It was very well written with a lot of unforeseen twists and turns. Even during the a few places where there was a lull in the action, the character development propelled you along. While reading the book you travel all over the world, and the author did a great job and making you (the reader) feel as if you're in that country at the time. This book should be made into a movie. It reads like a James Bond novel. "Murder, betrayal, international intrigue + a haunting presence. Who should control and protect information flow? Timely. I predict you'll find this smart, engaging mystery hard to put down." "I'm an avid reader and this is one of the best books I've ever read. It's very well researched and informative on many levels, besides holding my interest throughout. I can't wait to see more from J. C. Ferguson." "This book is a must read for all who enjoy a good mystery. From the first page to the last I found myself totally absorbed in the story. International travels, love affairs, spies and murder all combine to make this novel outstanding in the category of suspense. Not only is this story filled with action, the characters come to life right before your eyes. They are interesting, colorful, and believable. Having read many suspense novels, this one is a 'must-read' for book clubs around the world. J.C. Ferguson has shown a talent for keeping readers on their toes from beginning to end with this superbly written novel." Read review on Carla's blog. JANUS CODE - A MUST READ FOR 2014!! "I could NOT put it down. Finished it in 3 nights. The topic really surprised me. HOW timely - wow, and I'm sure Mr. Snowden would like it, and every government would totally hate it...:)) Plus the male character development was a feminists dream..."
"Bought this book before I had a KindleFire for two reasons: I personally know the author and she has shared other manuscripts with me, so I know and like her writing style. She's also a friend and mentor. Not sure how many published endeavors she has, but know this: if you see J. C. Ferguson as the author, buy it! You won't be disappointed!" From Judge's commentary from the 22nd Annual Writer's Digest Self-Published Book Awards. "...you've created a gloriously insecure hero, which is a unique way to propel a story (too many characters in the world of fiction are perfect and boring)." "The role of technology in your story is particularly apt. Your knowledge in the area definitely comes through in the writing; you have definitely done your work in researching the background material." "In general, you have created an intricate, intriguing story, but I wish the pace were perhaps 20 percent faster."